Prime Minister Sheikh Hasina has again warned of tough actions against ‘vicious attempts’ to push Bangladesh towards destruction through violent blockade and shutdowns. “It’s intolerable that attempts are being made to thrust the country towards devastation when we are moving forward,” she said on Thursday. She also asked for everyone’s support to protect the country from ‘criminalisation’. 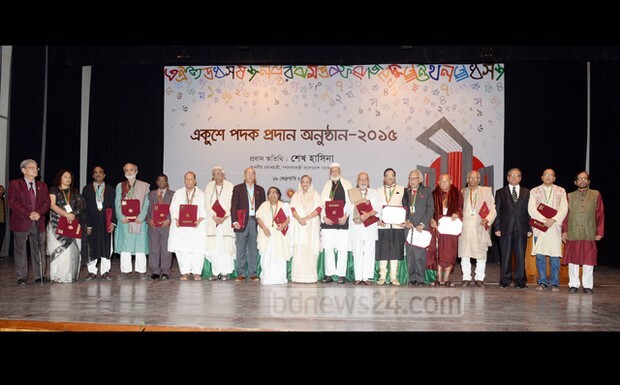 The prime minister was addressing the ceremony at the Osmani Memorial auditorium where she also handed over this year’s Ekushey Padak to 15 distinguished personalities for their contributions in their respective fields. “I want everyone’s help to free the country from such criminalisation,” she said. Her remarks came in light of the ongoing BNP-led 20-Party alliance’s violent nationwide transport blockade that started on Jan 5. The coalition has also started observing shutdowns on the workdays recently. At least 100 people have been killed and hundreds other injured in violence in the past one and a half months amid the blockade and shutdowns. “Bangladesh is making progress, why is this attack taking place on the nation right at this moment?” Hasina asked. She also criticised the BNP and its allies for obstructing the students from taking exams and pursuing studies by enforcing violent programmes. The education ministry had to reschedule several SSC exams which started earlier this month due to the blockade and shutdowns called by the coalition. “They (BNP-led coalition) are calling shutdown for every working day, whenever there’s an exam scheduled. It’s like their shutdowns are against the students, to get in the way of their exams or education,” Hasina observed. The prime minister also rattled off a list of major developments Bangladesh made in different sectors in the past six years. The government earlier this month had announced the names of 15 personalities for this year’s Ekushey Padak. Hasina at the awards ceremony handed each recipient a gold medal, a citation, and a cheque of Tk 100,000.